Provides 90 hours of training that is required (in addition to workplace training) for admission as a legal practitioner of the Supreme Court of Queensland. If you are a trainee solicitor in a supervised workplace experience program (articles) you need to complete 90 hours of training in addition to your workplace training to satisfy the legal practitioner admissions rules. 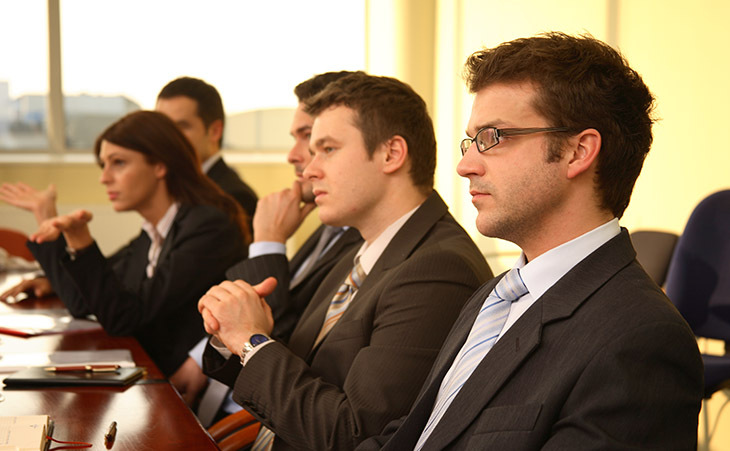 The Trainee Solicitor Program provides the required 90 hours of approved training. You are able to enrol, pay for, and complete the majority of the training online any time of the year over a 12 month period. QUT's Trainee Solicitor Program (TSP) provides approved training that incorporates your choice of either one core area of practice or two elective areas of practice. As you may know, your workplace training has to cover all the areas of practice set out in the Admission Rules. QUT's TSP program enables you to cover some of those areas as part of your approved training requirement. If you need to complete training in other practice areas that aren't covered in your workplace, we can help you by providing approved supplementary training in those areas. QUT has been approved by the Legal Practitioners Admissions Board to provide both approved training and supplementary training. Our training is provided online. You can commence training at any time you wish. While Criminal law has a one day attendance component, all the other units can be completed wholly on-line. You will complete each unit within a 6 month period from the commencement date, and will be provided with a suggested timetable to assist with time management. We provide high quality training backed by our extensive experience in training Queensland legal practitioners, our on-line delivery platform and our friendly and helpful staff. Law graduates who are completing Supervised Workplace Experience programs (formerly known as 'articles of clerkship') in law firms are required to complete 90 hours of approved training as a prerequisite for admission as a legal practitioner of the Supreme Court of Queensland (see rule 9 of the Supreme Court (Admission) Rules 2004). For the 90-hour Trainee Solicitor Program (TSP), you complete a compulsory ethics component. In addition you may choose one 12 credit point core unit or two 6 credit point elective units. In order to meet the Queensland admission requirements you must complete two elective areas, either as part of your training in the workplace or as part of your approved or supplementary training. Trainees who are undertaking supplementary training may also choose from the units listed above in order to meet the list of workplace competencies that are required under the admissions legislation. You can start training at any time. $2,090 (GST exempt) includes the compulsory Ethics component, plus either 2 x 6 credit point 'elective' units or 1 x 12 credit point 'core' unit. You can register for supplementary training if your firm cannot provide training in all of the legislated areas of practice and you haven't covered them in your approved training. The program is delivered via flexible online learning. Criminal law has a one day attendance component, but all the other units can be completed wholly online. For further information about the course, contact the Legal Practice Unit. For more information about registration or payments queries, contact QUTeX.